With the recent success of the film Twelve Years a Slave interest in the reality of being enslaved in the American South has been brought to the forefront of consciousness. It isn’t acceptable to ignore the past just because it is unpalatable. 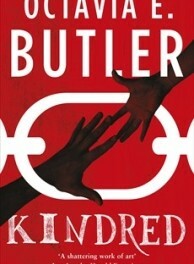 It is good, then to see the works of Octavia Butler coming back into print, and in particular Kindred. Although not as hard-hitting as it could be, it nevertheless should make the reader consider the iniquities of our past, particularly those brought up in America. The main character is Dana, an educated black American. On her twenty-sixth birthday, she and Kevin, her white husband, are moving into their new apartment when she is overwhelmed by a dizzy spell. She opens her eyes to find herself on the shores of a lake in which a four-year-old boy is drowning. Acting by instinct, she pulls him out and resuscitates him. When the boy’s father threatens to shoot her, she finds herself back in the apartment only seconds later. She might have believed that it was some kind of hallucination except for the fact that Kevin saw her disappear and reappear and she is covered in mud. Using the small amount of information she was able to gather, Dana works out that the boy, Rufus, was her ancestor and the son of a plantation and slave owner in the early 19th century. The next time this happens, Dana prevents Rufus burning down his house. She is longer in the past this time and discovers two things – first that she must keep Rufus alive long enough to become her ancestor, and secondly that to be black and apparently masterless is very dangerous. Although there are free men of colour, the assumption is that a lone black is a runaway. Dana is not equipped to live in that era, her attitudes are too ‘white’, yet the third time she is drawn back she has to spend several months pretending to be a slave. Conditions on the plantation Rufus’s father owns are not as severe as on neighbouring ones but the penalties are equally harsh. Examples have to be made to prevent property running off, and teaching slaves to read would be giving them ideas above their station. Dana has to tread carefully. Accidentally taking Kevin back with her is both useful and disastrous. Both of them learn a lot about their history and, more importantly, how the situation has changed for the better. As a result, they are less likely to take for granted the privileges that they have and that were denied to fellow humans in the past. A question for debate. 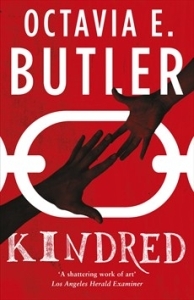 This is very definitely uses SF tropes, but would it have been published in 1979 if an SF writer other than Octavia Butler had written it. While I hope so, the perspective she can bring to it was out of reach of most of her contemporaries. Also, it seems that she is allowed to use language that I would be taken to task for, even, as she does, it is used in the context of the period. It may be thirty-five years since this book was written but it still retains a freshness that makes it readable and relevant today. If you have never read it, put it on your to do list, if you have, revisit it. You will find it worthwhile.